Anatomy of a Creative Commons license – Hi, I'm Jörg. “Layers” by Creative Commons is licensed under a Creative Commons Attribution 4.0 International license. As a next post in this series, I will explain the anatomy of a Creative Commons (CC) license, which build on copyright law. The licenses are used amongst others for Open Access publishing, which yields a lot of academic, economic, as well as social advantages. 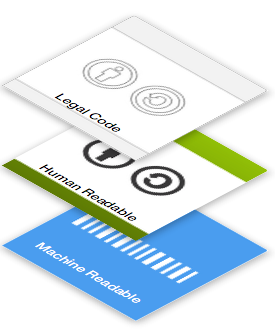 They include three layers, a legal code, a human readable layer, and a machine readable code. The legal code entails the terms and conditions and are legally enforceable in court. The human readable layer presents the main license terms in language understandable for non-lawyers. The machine readable code is a form of metadata attached to the work, which makes it search- and findable by search engines. The creator of a work which is published with a CC license, also called licensor, has to make a two key decisions, regarding what other people are allowed to do with his or her work. Firstly, do they want to allow commercial use and secondly, do they allow derivative works/adaptations. Should a licensor allow derivative works, he or she can also require licensees to make their work available under the same license terms. Licensees, that is people, who reuse CC licensed works, always have to credit to the licensor. “Creative Commons licensing help chart from Foter.” (cropped) by Foter.com is licensed under a Creative Commons Attribution-ShareAlike 3.0 Unported license. These four elements can be combined to six licenses, which are presented in the picture “Creative Commons”. As stated above, CC licenses build on copyright law, which means that all exceptions and limitations to copyright affect also affect CC licenses. In addtion to the six licenses, Creative Commons also provides a tool for licensors who wish to disclaim their copyright entirely. In this situation, licensors can use the CC0 public domain dedication tool, which is also made up of the three layers described initially.